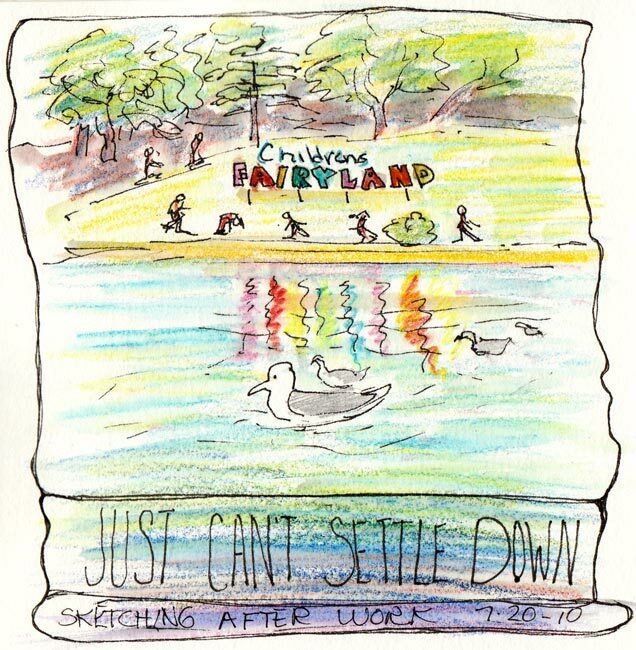 After work Tuesday night we met to sketch at Lake Merritt which is across the street from my office. I guess I drank too much coffee that day because I couldn’t settle down and focus. There was a fascinating parade of people walking by, all talking to each other or on cellphones, leaving bits of conversation in their wake. 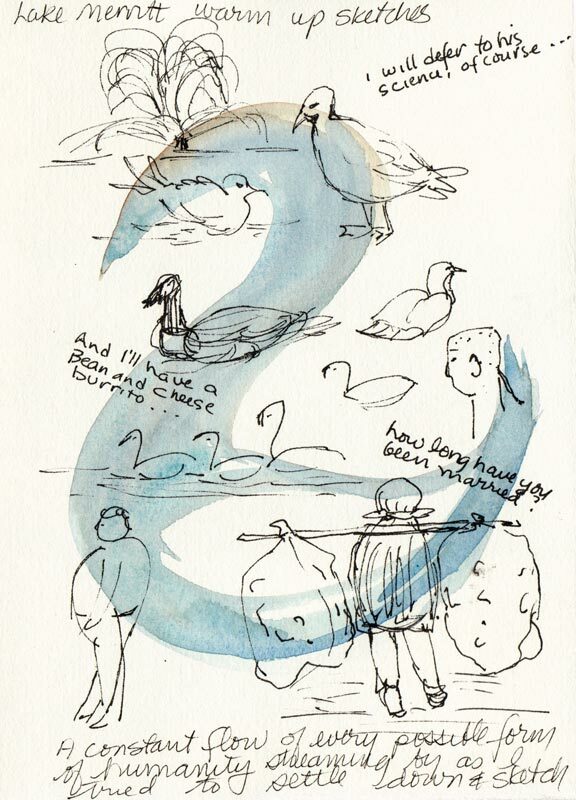 I warmed up with some sketches of the local seabirds and passing people, noting a few conversation snippets. That’s an old Chinese lady with a pole over her shoulders carrying huge garbage bags on either side that were bigger than she was. I assume she was gathering cans to recycle for a few dollars. When it got cold and windy we headed up to my office on the 25th floor and drew the view out the window. I liked my sketch of the building and tall trees at the bottom of the page but instead of stopping there, I kept drawing until the page was full. I didn’t like that so tried various ways to hide the rest and finally pasted ruled tracing paper over it. PS-I used to love going to Fairyland. Wasn’t there some kind of key you got? I agree with Julie. And you captured the afternoon with those snippets of dialog and sketches and they are great fun. 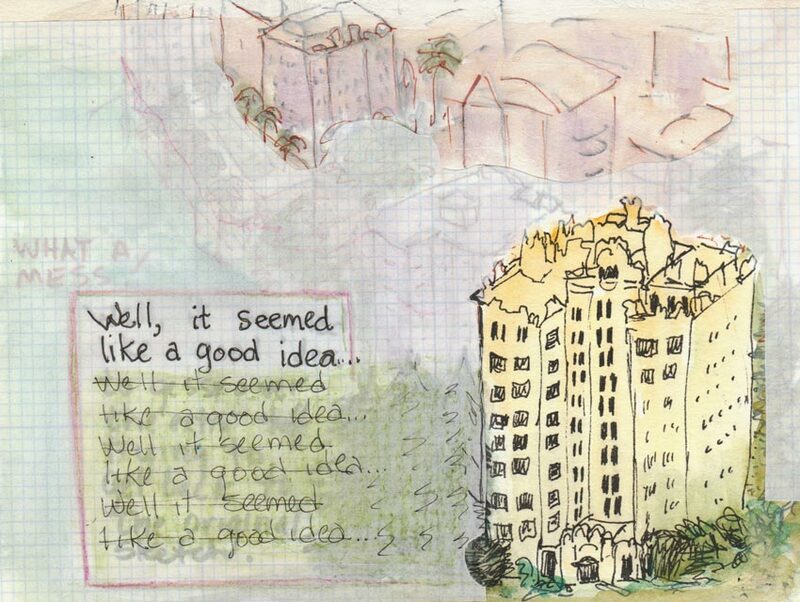 I like that you share your good and not so good days of sketching. I think we all have some of each. I also like your “conversation snippets”. I also like to include those in my journals, especially when I am traveling. Sometimes it’s hard for me to make that transition from work to sketching…..and coffee doesn’t necessarily help! But I’m glad you posted this….I like that you post when it works, and when it doesn’t, and just keep moving forward! Just that you are spending time “seeing” and recording is a good thing. Your brain was working in an alternative way than usual. Yes, Jana, even the “warts and all” times are worth it.